We went to Norfolk this weekend - to the seaside! We went to a B&B right on the water, called the Keswick Hotel. It turned out to be a fantastic gem of a place. It was all very non-Fawlty Towers-like. The best part was that they had a baby monitor, so Matthew & I had a great date at the hotel restaurant. The owner is a chef, and everything was sooo good, but I think all restaurant food tastes better without a baby at the table. You can savour every bite, as opposed to wolf it all down before Eliz gets bored. The weekend got off to a bit of a rocky start. Matthew picked up the rental car and got home for 4:30, but somehow we didn't end up leaving until after 5:15. How does that happen, when you are so sure that everything is all ready to go?? No worries, we got on the road, and were about 30 minutes into our 2 hour drive when Matthew looked at me and said, "We forgot the stroller." Well, great. That sentence was followed by a great big "bllleeeecccck" from Elizabeth, and she puked all over herself. Well, double great. Jammy (from the back seat, where I'm reading the Google instructions by the light of my phone, and 'playing' with Eliz who is post-puke-hungry-but-not-going-to-eat-anything): Okay, babe, this is Hare Road. We have to go 0.6 miles and then turn left onto Broad Lane. What's your mileage? (Keep in mind, there are no street lights, and Hawkeye is having to do that thing where you turn on your brights and then turn them off when another car is coming towards you - - - every 15 seconds they were on and off, on and off, on and off....). Jammy: Okay, Elizabeth, would you like to read this book about puppies? Elizabeth: No! No! No! No! No! No! Jammy: (big breath) Okay, what book would you like? Matthew: Okay, well, we're at that mileage, but this road has no lights, and no sign. Jammy: Babe, we're going to have to trust Google, because these roads don't even show up on our regular map. They just have names, not numbers. We are never going to get out of this neighbourhood. I'm not sure how we got there without (a) fighting, (2) getting lost, or (d) Elizabeth puking again, but we did. And after that, the weekend was carefree. 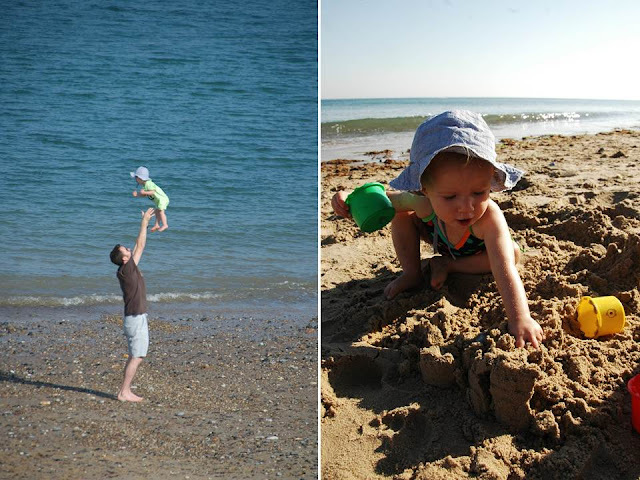 Seaside holidays are really the best with a little one. 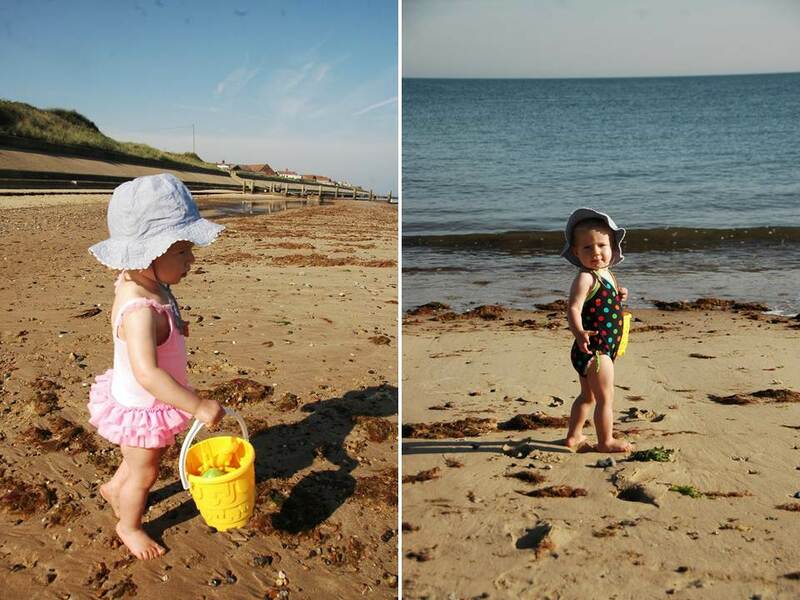 The sea was less than a minute outside our hotel, so after breakfast both days, we just put our baby in her swimsuit and hat, and down we went. 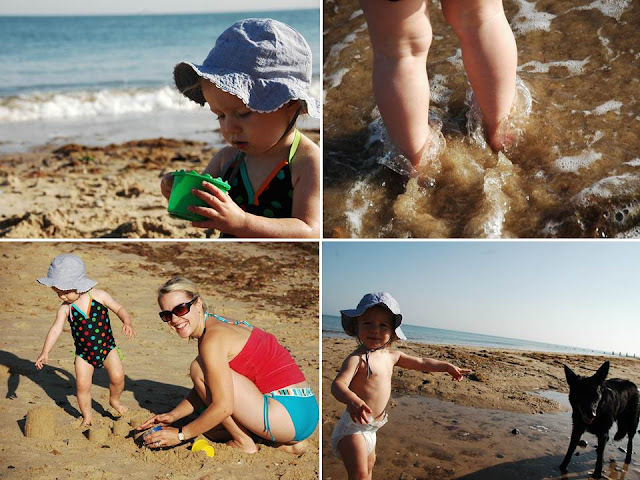 She played with a bucket and rocks, she played in her own ocean that her Daddy made her (ie dug a hole and filled it with water), she ran into the ocean and then ran away from the waves, giggling and laughing. Me: "This is the beach, can you say beach?" Me:"This is sand, can you say sand?" Me: "These are called waves, can you say wave?" Eliz: "Byeeeee!! ", and waved her hands to the water. 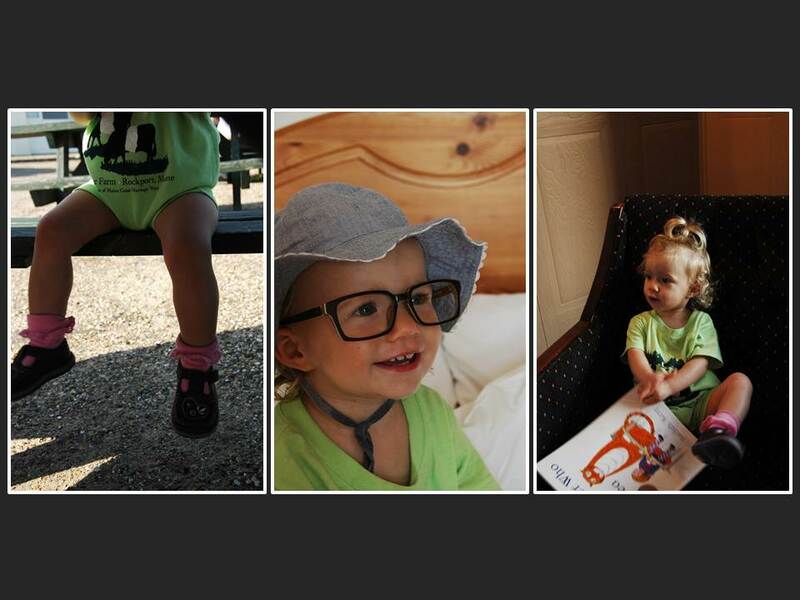 Seriously, so cute. Also, there were roughly 8 million dogs on the beach, playing and running and swimming. Now Elizabeth's definition of heaven is a seaside with dogs and a pail to put rocks in. This is what you get when you Google search "British Beach Wind Breakers". 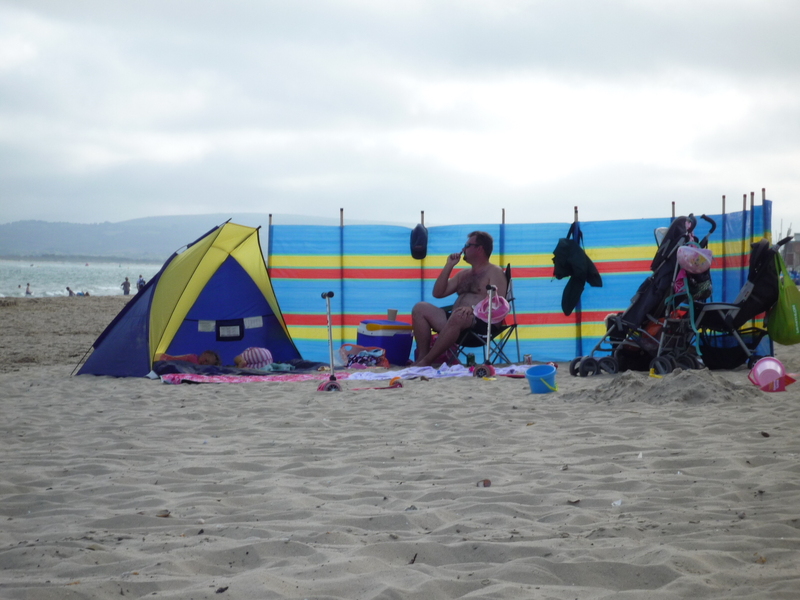 And this is what you see on every single British beach. On Sunday, Elizabeth fell asleep in her high chair when we were having the Sunday roast lunch - adorable. All in all, it was so fantastic to getaway to the seaside - and yes, seaside is the most British word I say now. Yay! Some very cute photos. I especially love the photo of her being thrown in midair! And also the handprints photo at the end.